Chandrayaan-1 was India's first mission to the moon. It operated for almost a year (between October 2008 and August 2009). The lunar orbiter is best known for helping to discover evidence of water molecules on the moon. The Indian Space Research Organization (ISRO) is developing a successor mission called Chandrayaan-2, which is expected to launch to the moon in 2018. The name Chandrayaan means "Moon Craft" in ancient Sanskrit, according to NASA. The Chandrayaan-1 spacecraft was based on an Indian meteorological satellite called Kalpansat. It was about the size of a refrigerator, with a dry weight (weight without fuel) of about 525 kilograms (1,160 lbs.) and was powered by a solar array that charged lithium-ion batteries on board. Chandrayaan-1 launched on Oct. 22, 2008, from the Satish Dhawan Space Center in Sriharikota, India, aboard a Polar Satellite Launch Vehicle rocket, according to NASA. It reached the moon on Nov. 8, 2008. The spacecraft released its Moon Impact Probe on Nov. 14, which crashed into the moon on the same day. The spacecraft initially performed its work from a mapping orbit at an altitude of 100 kilometers (62 miles), ISRO said. In May 2009, controllers raised the orbit to 200 km (124 miles). Chandrayaan-1 made 3,400 orbits of the moon and continued transmitting data until Aug. 29, 2009, when controllers permanently lost communication with the spacecraft. Chandrayaan-1 was intended not only to be a demonstration of India's technology in space, but also was expected to return scientific information about the moon, according to NASA. Its major goal was to collect data about the moon's geology, mineralogy and topography. Terrain Mapping Camera (TMC), which provided a high-resolution map of the moon. Hyper Spectral Imager (HySI), which performed mineralogical mapping. Lunar Laser Ranging Instrument (LLRI), which returned information about the moon's topography (height of certain features). High Energy X-ray Spectrometer (HEX), which examined radioactive elements on the surface. Moon Impact Probe (MIP), which was intentionally crashed into the moon's south pole. The debris from its impact aided Chandrayaan-1 in its search for lunar water. There also were several instruments on board from other space agencies. Chandrayaan-I X-ray Spectrometer or CIXS (from the United Kingdom's Rutherford Appleton laboratory, the European Space Agency and ISRO). This fluorescence spectrometer measured the abundance of certain minerals on the moon's surface. Near Infrared Spectrometer or SIR-2 (from the ESA). This also mapped minerals, in infrared wavelengths. Sub keV Atom Reflecting Analyzer or SARA (also from the ESA), which studied the interaction between the solar wind (constant stream of particles from the sun) and the lunar surface by measuring energetic neutral atoms emitted from the surface. Miniature Synthetic Aperture Radar or Mini SAR (from NASA), which searched for water ice near the lunar poles. Moon Mineralogy Mapper or M3 (also from NASA), an imaging spectrometer that also revealed information about the moon's mineral composition. Radiation Dose Monitor or RADOM-7 (form the Bulgarian Academy of Sciences), which examined the radiation environment around the moon. Notably, Chandrayaan-1's data helped determine the presence of water ice on the moon, which NASA announced in September 2009. The agency's Moon Mineralogy Mapper detected evidence of a hydrogen-oxygen chemical bond (hinting at water or hydroxyl) when looking at the top area of the moon's regolith (soil). The signal of water appeared to be stronger at the poles. After NASA's announcement, ISRO said its Moon Impact Probe had also detected the signature of water on the moon, just before it impacted the surface. The water signal was confirmed by other spacecraft observations. The Cassini spacecraft spotted the water/hydroxyl signal in 1999 while passing by the moon on its way to Saturn. And the Deep Impact spacecraft's extended EPOXI mission examined the moon in infrared wavelengths (after a request from the M3 team). Deep Impact/EPOXI found the signal while making several flybys of the moon and Earth on its way to comet 103P/Hartley 2. 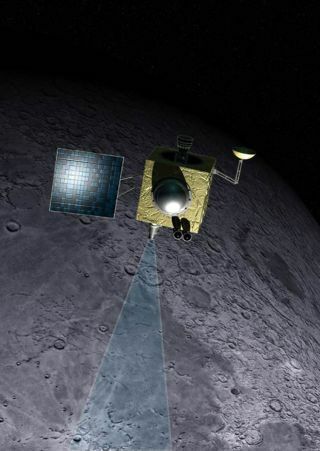 Follow-up observations by NASA's LCROSS (Lunar CRater Observation and Sensing Satellite) found more water at the moon's south pole, NASA announced in November 2009. This and other observations of water ice by the Lunar Reconnaissance Orbiter (LRO) in the years since have led some engineers to speculate that future explorers could use the reservoirs for lunar colonies, depending on how much water is available. In March 2017, researchers located Chandrayaan-1 in a polar orbit that was about 200 kilometers (125 miles) above the lunar surface. The spacecraft's orbit was about 180 degrees or half a cycle from orbital estimates in 2009. The team found the spacecraft using radar from NASA's Goldstone Deep Space Communications Complex, with some follow-up work from the Arecibo Observatory in Puerto Rico.